I was delighted to join this week with state and local officials to welcome Lieutenant Governor Karyn Polito and Highway Administrator Jonathan Gulliver to celebrate the completion of the project to rehabilitate the bridge that carries Main Street over the Parker River in Newbury. The bridge is the first project completed through the Baker-Polito Administration’s Municipal Small Bridge Program. The Town of Newbury received $360,000 for their bridge rehabilitation project through the first round of the Municipal Small Bridge Program. 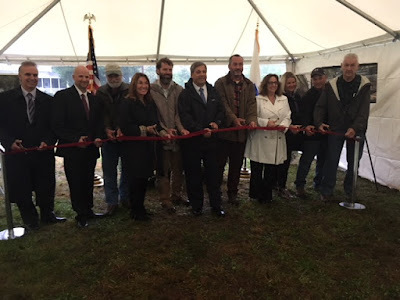 The partnership between state government and the town made this project happen - the result is a rehabilitated bridge that was in need of repair and was awarded the funds that might otherwise not be within reach in a municipal budget. Created by the Administration in 2016, the Municipal Small Bridge Program provides funding to cities and towns to aid in the replacement or preservation of municipally-owned bridges between ten and twenty feet which are not eligible for federal aid, and are at high risk for full or partial closure. The full scope of work for the project in Newbury included reinforcing the bridge’s concrete deck and deck beams, installing a new railing system, adding new concrete slabs to support the railing system, and utility operations. Work began in May 2018 and was completed three weeks ahead of schedule.